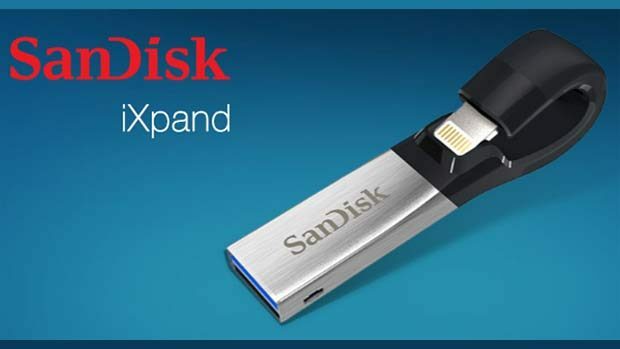 Summary: The iXpand Flash Drive from SanDisk is truly a clever storage option for iPhone and iPad users! 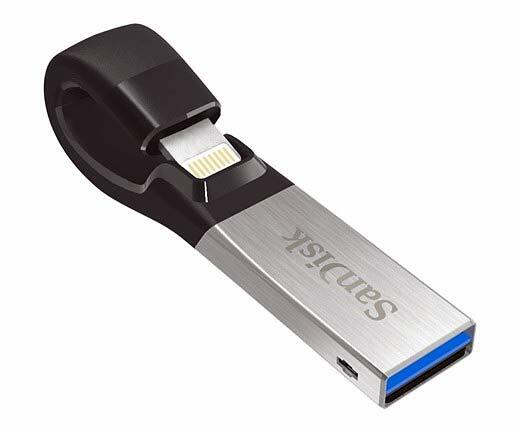 This is the second generation of iXpand devices from SanDisk which allow you to transfer files to and from this device via an iPhone or iPad through the lightning connector but best of all, it boasts USB 3.0 speeds and even the ability to encrypt files. Sure it can be used on other devices but we’re checking it out for what it was made for, mobile Apple devices and for our review, we tested the iXpand on the iPhone 6s. 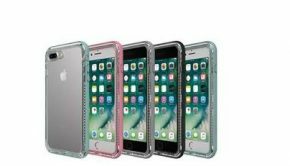 The first thing that we noticed about the iXpand was its unique design that features a flexible connector which allows it to be used on a variety of Apple mobile smart devices, including cases. So if your iPad has a thicker case or your iPhone for that matter, the flexible nature of the connector easily bends to fit. 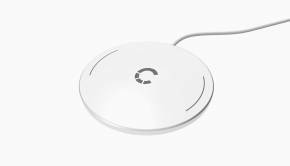 Another great aspect about it as it doesn’t really protrude that much, means you can have it installed almost all the time without it getting in the way. 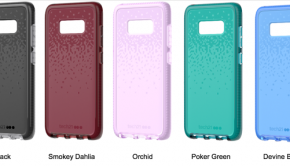 Also out of the box, it feels like a well-made product and quite durable. 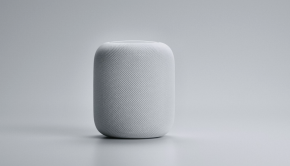 The only slight issue with the product is that the USB or the lightning connector ends are not protected so you may need to be a little careful while it’s not in use. In order to use this device on your Apple device, you simply connect it to your product and download the iXpand Drive app which basically gives you additional storage for your device. Not only does it allow you to sync photos and videos but you can also play directly from the drive which means watching movies and listening to music. 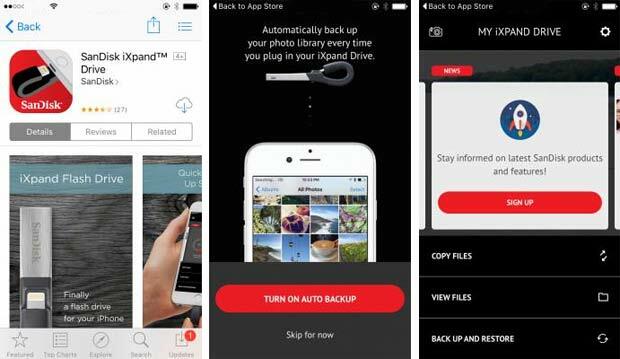 Furthermore, the app also backups key information from your apple devices like photos, videos, contacts and it displays how much free space is on your iPhone/iPad, including the iXpand itself. It even has the ability to have photos and videos stored directly on the Flash Drive but you need to use the camera that comes with the app which is quite simplistic. However where it shone for me was the ability of copying other files between both devices and to access different media files. Fans of social media will also appreciate the ability to backup photos from sites such as Facebook and Instagram but just be sure to do this via a Wi-Fi connection. In terms of protecting files, the user does have access to the SanDiskSecureAccessVault which allows you password protect whatever gets put into this directory. 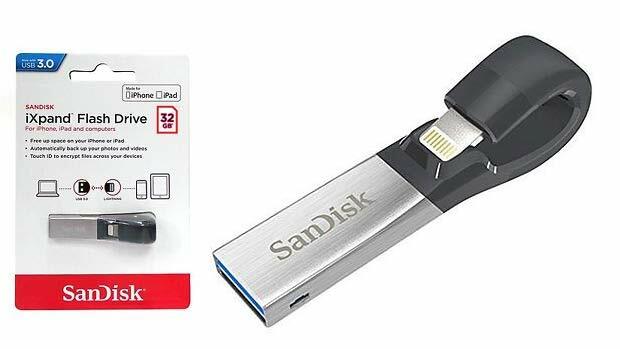 If you’re running out of space on your iPad or iPhone, then check out the SanDisk iXpand Flash Drive which gives you four different sizes (16, 32 & 64GB) to expand your storage on portable Apple devices. Installation is easy, the app is quite user friendly and all in all, it’s a great product from SanDisk!